The backdrop to the course is the Cooley Mountains. The master's race was preceded by ten youngster’s events. The four women competed as individuals in their respective categories and combined to make the W50 team. Colette Tuohy was competing in her first race in W50 which had thirty eight finishers – a very competitive field - and she ran a great race to come home third. Pauline Moran claimed another gold, winning W60 with an excellent performance ahead of eight in that category. Mags Glavey won the W65 race in a close finish, to add another gold to her tally. Ann Murray finished 22nd in W50. She combined with Colette, Pauline and Mags to win W50 team silver behind City of Derry AC Spartans. 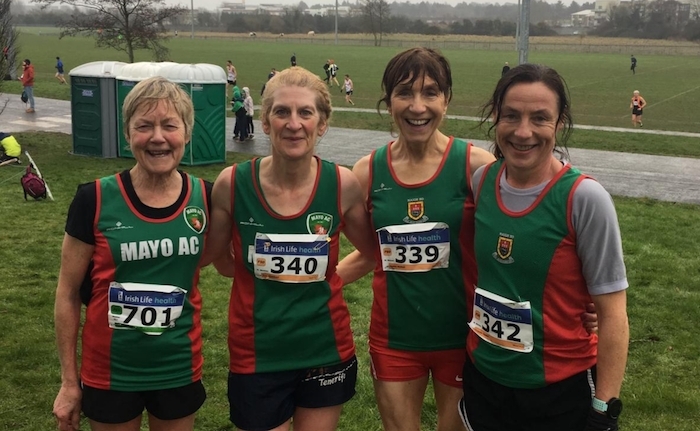 In the Marugame Half Marathon in Japan on February 3, Mayo AC's Melbourne-based Sinéad Diver finished in a brilliant third place in 1:08:55, improving her own PB and world W40 best set last August, by 25 seconds. Charlotte Purdue (GBR ) was fourth in 1:09:46, her first sub-70-minute performance. It was a great start of the year for Sinéad who had a superb 2018 as she builds up in preparation for the London Marathon in April. She is in the elite women’s list recently announced by the organisers. Sinéad (South Melbourne AC ) and Charlotte Purdue have been training together with the Melbourne Track Club and Charlotte is also elite listed for London. Both are also aiming to represent Australia and England respectively in the Tokyo 2020 Olympics.